The Moon Project and Lost Souls are multiplayer-compatible with each other provided The Moon Project is patched to version 2.0 or higher. Frame rate is capped at 20 FPS. Earth 2150 Trilogy collection. Includes The Moon Project and Lost Souls. Includes The Moon Project and Lost Souls. Earth 2150 Trilogy. Escape from the Blue Planet, The Moon Project, and Lost Souls also available individually. DRM: Reality Pump activation. Includes The Moon Project and Lost Souls. 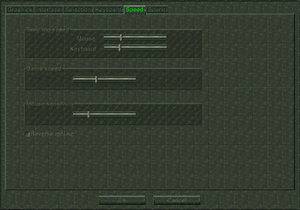 All menu screens, including the graphics and audio settings screens, are unique for all factions; however, they all have exactly the same wording, format, and settings, so the difference is merely superficial. 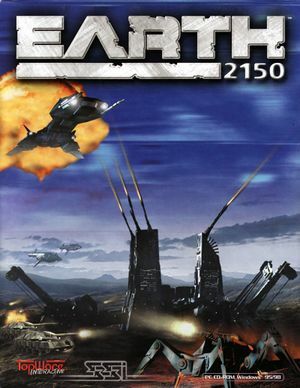 Unlike its expansions, the setup utility and the in-game graphics settings for the base game, Earth 2150, has a hardware-accelerated sound section and lacks the ability to adjust the maximum zoom level, respectively. Use dgVoodoo 2 and Direct3D HAL adapter. Mouse cursor disappears if height is above 1800px, so a custom resolution of 2400x1800 is recommened. 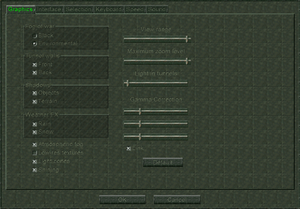 Can be forced in your GPU's control panel (or via dgVoodoo 2). Frame rate is capped at 20 FPS. Increasing the cap speeds up all the game's functions. Change the value of AllowWindowedScreen to 1. 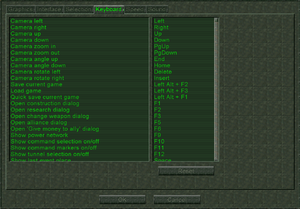 Unlike its expansions, the in-game speed and acceleration settings for the base game, Earth 2150, lacks the ability to invert (reverse) mouse input. Only in The Moon Project and Lost Souls. 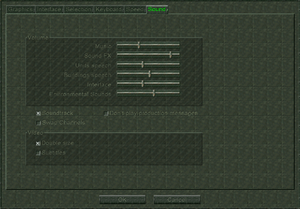 Unlike its expansions, the in-game audio settings for the base game, Earth 2150, lacks the ability to disable production messages. Via DirectSound3D when using hardware-accelerated audio. Not available in Lost Souls. If Earth 2150 or its expansions are set to a 16:9 resolution, the game will crash as soon as you attempt to use the Construction menu in-game. If Earth 2150 or its expansions appears on the wrong monitor on your multi-monitor setup, you'll need to tell the game which monitor to use. From the list of renderers on the right, select "RGB Emulation". From the list of resolutions, choose any resolution between 640x480 and 800x600. Bit depth does not matter. ↑ 2.0 2.1 2.2 When running this game without Administrator elevation, 32-bit programs writing to HKEY_LOCAL_MACHINE\SOFTWARE will be redirected to HKEY_CURRENT_USER\Software\Classes\VirtualStore\MACHINE\SOFTWARE\Wow6432Node (more details). ↑ 3.0 3.1 File/folder structure within this directory reflects the path(s) listed for Windows and/or Steam game data (use Wine regedit to access Windows registry paths). Games with Steam Cloud support may store data in ~/.steam/steam/userdata/<user-id>/253880/ in addition to or instead of this directory. The app ID (253880) may differ in some cases. Treat backslashes as forward slashes. See the glossary page for details. ↑ Steam Community Announcement - Mac OSX Port available now! ↑ The Moon Project official site, "Version 2.0 released!" This page was last edited on 29 March 2019, at 11:41.